Subject: State Government Employees Group Insurance Scheme, 1983 – Table of Benefits Under Savings Fund for the membership period from 469th month to 492nd month. In continuation of this Department Memo No. 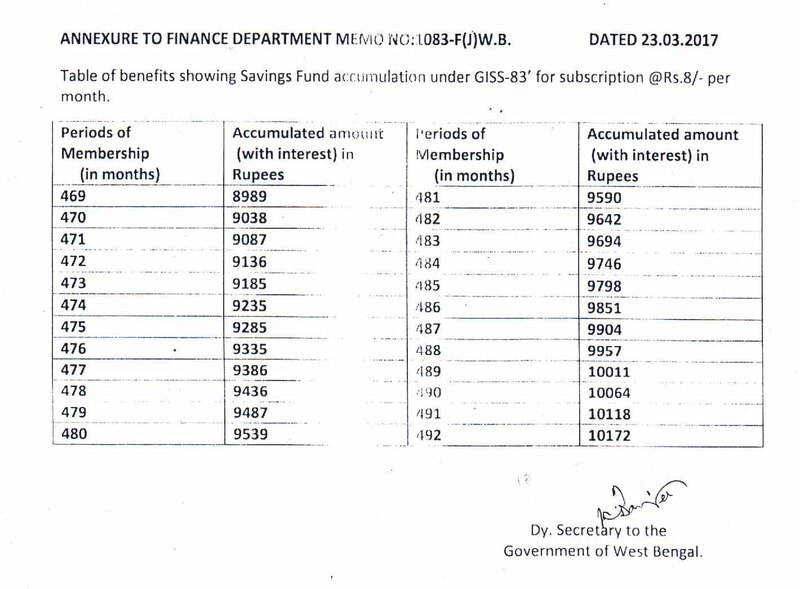 2255-F(J)WB dated 02.04.2015 the undersigned is directed to say that a new table of Savings Fund benefits under the above mentioned scheme has been drawn up for further period of membership from the 469th month to the 492nd month counted from April, 1978 and a copy of the same is annexed for guidance of all concerned. The table shows the accumulated amounts as payable on Savings Fund Account to the members of the scheme corresponding to the period of membership as noted against each. 2. Any subscription remaining due on the date of retirement/death shall be recovered with interest from the entitlements as shown in the table. 3. All heads of Departments/ Offices are requested to circulate copies to all Offices/DDOs under their control.